Vacation in relaxing comfort at 11 Big Leaf. 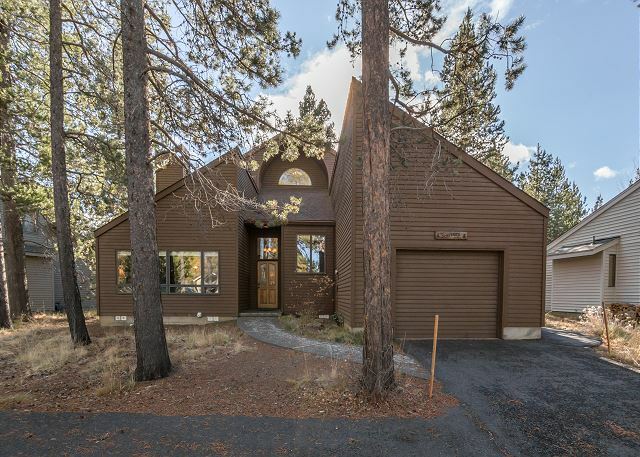 This home is centrally located, near the Woodlands Golf Course, with easy access to trails to Fort Rock Park and the Deschutes River. 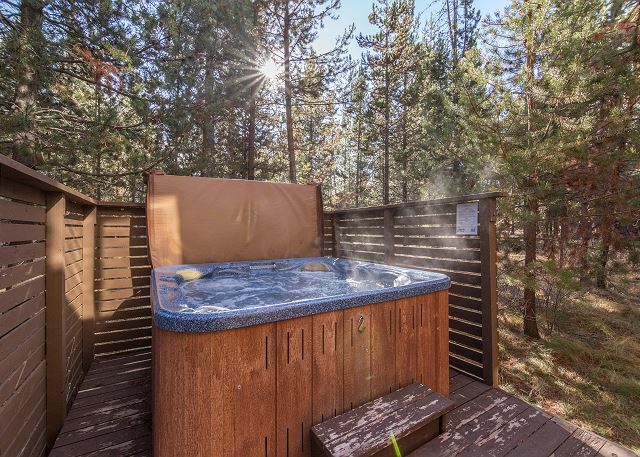 Invite up to 6 guests to soak in the private hot tub after a delicious meal prepared in the well appointed kitchen; get cozy by the river-rock fireplace while enjoying one of the numerous movies, board games, or books after a day of hiking or hitting the slopes. The well stocked kitchen with seating area and bar for 6 leads to the private deck. The master bedroom has a king bed complete with private bathroom and jacuzzi, the 2nd bedroom has a queen bed with adjacent bathroom. Take the ladder from the second floor family room to the loft area for some quiet time and a chance to gaze at the stars. The bedrooms are charming with their detailed cabin inspired décor. After you've taken some time to reconnect with nature with a ride on one of the many bikes, grill something tasty on the gas BBQ as you soak up Sunrivers' year round sunshine! Sure to exceed your expectations... and don’t forget your four legged best friend! If you would like further information about this Sunriver vacation rental or our property management services please call 1-800-541-1756. We all loved this home and had a great quiet Thanksgiving here. The home was stocked with every kitchen amenity you could ask for, we loved the vaulted ceilings and quiet neighborhood. A 5 star review all the way! Thank You for the 5 star review, Melodie! We are happy to hear that you loved the home and had a wonderful Holiday there, come back soon! The property was clean, comfortable, and well-maintained. Safe neighborhood, but a distance from the village. Because this house has a code to enter, rather than a key, it was extremely convenient for us, as we got in after 5:00 p.m. The management company responded immediately when we told them the heat lamp above the whirlpool had shattered. While the house was comfortable, it is definitely a vacation house. The plumbing system is really loud. The house was well stocked and we cooked every night. The management company was a bit difficult to find. We really appreciated the shuttle to Mt. Bachelor. Overall, great stay. Thank you for staying with us at Sunset Lodging in Sunriver and the home at Big Leaf 11. We're glad to hear you took advantage of the free shuttle to Mt. Bachelor and that you had a pleasant experience overall. We look forward to welcoming you back to Sunriver soon! Thank you! Very nice house. We were two adults, two kids and our dog and there was enough room in the house that we could all relax but it's not so big that we felt disconnected. Nice hot tub, beautiful and quiet neighborhood and a clean, well maintained house. The bikes were great and it was enjoyable playing some music on the speaker system when we were making breakfast. We would definitely stay here again. Thanks so much for the great review! We are so happy that your family was able to enjoy a nice relaxing trip to Sunriver. Hope to see you again soon! We had a great time and loved the location of the house..very private. Kitchen was nicely stocked with kitchen utensils & tons of movies to watch at night by the fire. So glad you enjoyed your stay at Big Leaf 11, Alissa! We hope to see you back in Sunriver soon! We will return to Big Leaf 11! It's a wonderful house and perfect for families. See you next summer! Our family enjoyed staying in this home. It was clean, roomy, and comfortable. There was an amazing supply of books, games, and videos everywhere you looked. The decorations of the home were fun and welcoming. Our teen boys loved the loft area, but it's definitely not appropriate for younger kids since the ladder is so high. The location was great, very easy to find and very quiet. A few issues though. The home allows pets so it has a bit of a dog smell. The hot tub controls are old so they don't respond well, the jets turn off when they feel like it so they were stuck on all night, and the light didn't work. 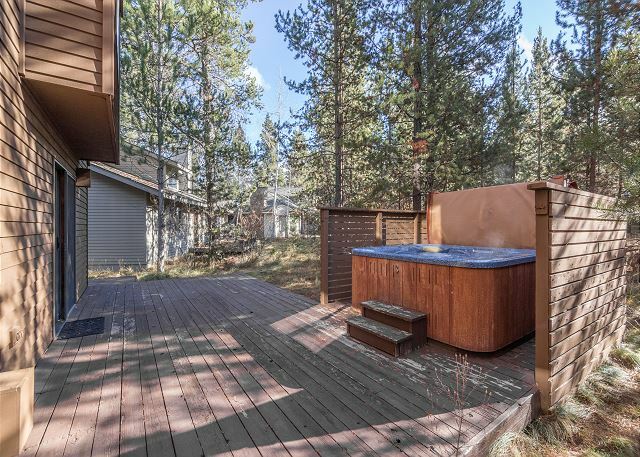 Hot tubs are a huge part of staying in Sunriver for my kids so it was an annoyance. The bikes are in very sad shape. There were 8 bikes but we struggled to find 2 that were usable and safe. All had brake issues. We left a message with management to let them know so hopefully the issues will be addressed. The beds are all comfortable. (Take note, the master bath has no door and hence no privacy!) The kitchen is well-stocked and in general it was a very nice house. Large home, somewhat outdated, but clean and had everything we needed. Enjoyed the mostly private back deck with hot tub. Quiet street. Appreciated having bikes and tennis rackets available for use. Enjoyed all the amenities Sunriver in general had to offer. So glad to hear you enjoyed yourselves, Jenelle!! We hope you'll get back to Sunriver soon! Our family enjoyed staying at Sunset Lodging's Big Leaf home. It provides a very private setting, and the home comes with all favorite amenities: barbecue, hot tub, jacuzzi tub, private rooms, fireplace, excellent book selection, plenty of DVDs, fully stocked kitchen, and aquatic center passes. We made use of all of these, and had a wonderful, relaxing stay. Those are great suggestions, Erica!! Candles really make a house feel like a home. The mosquitos were bad this year due to the water shortage. We are so glad they didn't hinder your stay too much. We're looking forward to having you back at Sunset Lodging just as soon as you can get here. Excellent!!! Loved the house and Sunriver. Wish it was a little closer to SHARC, but that is it. We have stayed in Big Leaf 11 at least four times over the last 4 or 5 years. Generally it is just my wife and I but our most recent stay included our daughter, son-in-law and their new baby. The home is very comfortable. There are a wide variety of pots, pans, dishes, etc. in the kitchen. There are lots of games, DVDs and VHS tapes to enjoy. Even though we do not know the owners, I usually feel like I'm in a vacation home some friends let us use. The house does not feel like some sterile vacation rental but a home that is lived in and enjoyed. 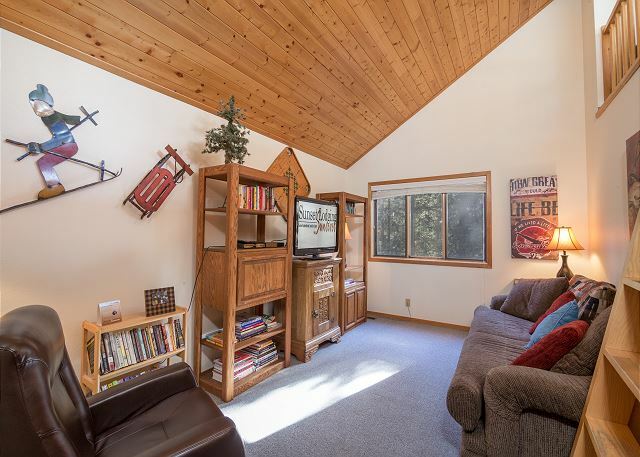 Like any home, it is not perfect but any time I've looked through the vacation rentals available at Sunriver, I have not seen another one that combines all the homey features we enjoy at Big Leaf 11. We downgraded from one of your premium homes as there would be only two couples for this reunion. We knew at the time were were renting one of your cheaper homes, but it was adequate for our needs. Clean, well-appointed, definitely a home away-from-home. Lots of books, videos and games in the home. The house is excellent. The heating was very efficient (only needed it for a short period one evening and the house warmed up swiftly). They provided 8 bikes (and a pump) - the big-tire kind that are suitable for riding around bike paths. There is a bike path currently under construction to Lava fields from Sunriver (ready Fall 2014), this will make the area even more attractive for family biking. I recommend the house. We were a party of two couples and a well-mannered dog. If you are a party of six; note that the ladder to the beds in the loft is very steep' so not for the smallest children. However this space is very cute and I can imagine kids would love the space. There are two sitting areas with TV's, so this would make a great place for a family to stay. We did not use the hot tub - but saw the service man; so it is maintained regularly. It does buzz constantly from the pump, so the outside sitting area was not that peaceful for the noise sensitive. Property managers charge a fee for what (when asked) they described as 'getting the discounts' - I would prefer this was not passed onto the client as I do not care for having 50% off a family photographic portrait and other equally random stuff. Have stayed at a lot of Sunriver properties..this was one of our favorites. Very cozy and comfy with a TON of books, puzzles and movies. Kitchen was also very well supplied. Location is great..if you like quiet! Just the 2 of us...never used the upper loft but could see you would have to be very careful going up and down the steep ladder. Upper part of the house would stay very warm in the summer months. House was very clean compared to others we have stayed at. Would stay again! great house in great shape. we really appreciated the free high speed wifi and that the house was so well stocked with books, games, movies, etc plus all the necessities like paper towels, dish soap, etc. Everything you could want, except beach towels for hot tub and going to the pool. Microwave needs to be replaced, it barely worked. We will rent again next time we come to Sunriver. Many thanks!